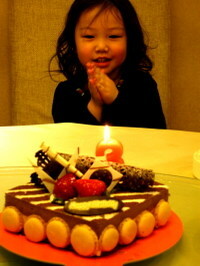 We celebrated Guenevere's third birthday this evening at a nearby Hunanese restaurant called 一湖春. She was about to blow out her candle when Fanfan stopped her and told her she should make a wish first. She clapped her hands together as if in prayer, and just after I snapped this photo, said quite seriously, "我想要巧克力" (I want chocolate). Her wish came true mere seconds later. I sang her to sleep a little over an hour ago with "Hush Little Baby." She's constantly stopping me now during the song to ask "looking glass 是什么?." I'm able to answer most of her "What's a so-and-so" questions pretty easily in that song, except for "jumping jack." Daddy, what's a jumping jack? "It's a toy that kids played with a long time ago. They're made of metal, and daddy doesn't remember how they were used, but it was a game where you bounce a little ball and you grab these little metal jumping jacks, and you never want to step on one barefoot." Those little things were like caltraps used in medieval warfare to take out horses, and it's astonishing to me that anyone ever let kids play with them. How did one play with jacks, anyway? I really don't know. Or tiddly-winks, for that matter. Don't know how that was played either, except that it involved little swallowable discs of plastic. You're right about jacks though. I have not seen any in years. Maybe I can find some here in Malaysia. If so will bring back some for you and Imagethief. Ha Ha! You know in England a Jumping Jack is also a toy which essentially looks like a box but when you open the lid out pops a puppet on a huge spring, equally dangerous but brilliant for scaring the crap out of your little sister! As for tiddlywinks I'll teach you how to play that one next time I see you! Happy B'day to Guenevere, she's definitely got your hair! Great post! You have an adorable daughter. Jumping jacks are actually different from the game of jacks. They are a figure ("Jack"), often dressed as a clown, with a string attached. When you pull the string, the jack's arms and legs fly up as if he is jumping (hence the exercise "jumping jacks"). Tiddly winks is a game using a cup, a large plastic disc (the "tiddly") and several small plastic discs (the "winks"). The player uses his tiddly to press on the winks and try to pop them into the cup, with the player getting the most winks into the cup as the winner. My 4-year-old daughter enjoys "Hush Little Baby", but the version I sing doesn't have a jumping jack in it - there are a mockingbird, diamond ring, looking glass, billy goat, cart and bull, dog named Rover, horse and cart, and of course, the sweetest little baby in town. What lyrics do you use? Mine came from Peter Paul and Mommy(Mary). Much enjoyment to you and Guenevere on discovering ancient European childhood amusements! @Denise - Thanks so much. She actually has a jumping jack (which is in the form of Sun Wukong, the Monkey King of Chinese folklore) and now I can explain to her that daddy was wrong and had conflated the game of jacks with proper jumping jacks. Thanks on tiddly winks too.